Betsson Group Affiliates Banner advertising network details. Betsson Group Affiliates is an online affiliate platform that promises clients to earn some of the highest commission rates in the industry. Betsson Group Affiliates provides a large portfolio of marketing plans according to your desired targets. Betsson Group Affiliates combines multiple top brands to achieve better experience in online marketing. The platform uses CPA and hybrid deals in order to handle sub-affiliation deals. Check the reviews on Affbank about Betsson Group Affiliates and for any details regarding their Target Audience, Pricing Models and Advertising Formats, reach the Information section. If you choose to join the Betsson Group Affiliates, you can do that by clicking on - Join Now! 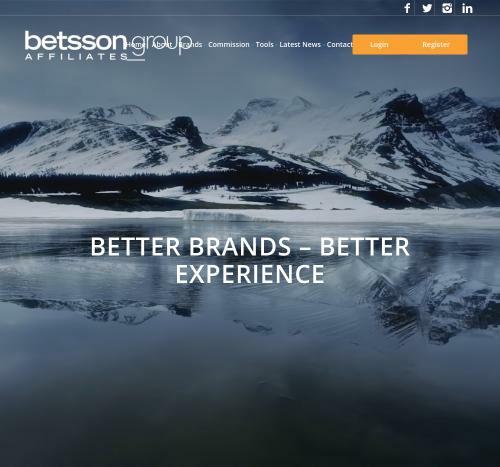 Once you create an account, you will get in touch with an experienced Team who will give the best to help you reach your goals with Betsson Group Affiliates.